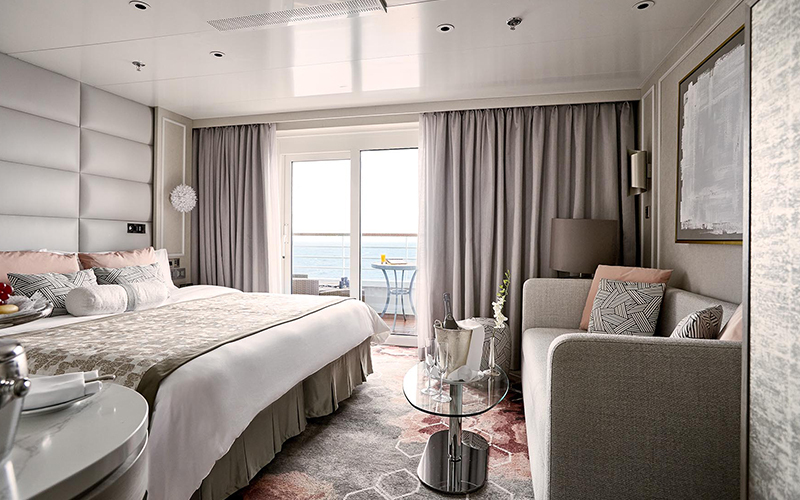 If you’re feeling tempted to escape the madness and head to the warm waters of Tahiti and beyond, but don’t know which cruise to choose, take a look at these suites and staterooms onboard Crystal Cruises. They may just make up your mind for you! 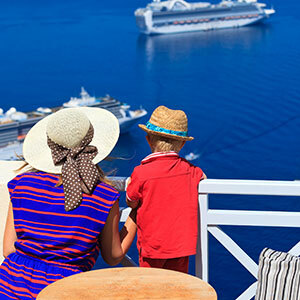 Crystal Cruises is all about all-inclusive luxury and legendary hospitality. From extraordinary cuisine to luxury amenities in your suite or stateroom, you’ll want for nothing. 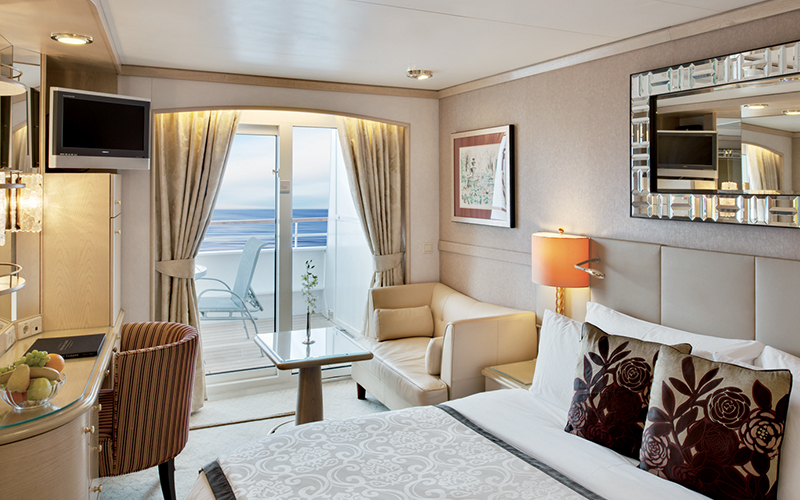 All Suites and Staterooms are elegantly furnished with plenty of room. Let’s start with the lead-in category and work our way up. This is the only category that doesn’t have a balcony but don’t despair! Unlike a lot of other cruise lines, you won’t find just a pokey porthole. Instead, you’ll still enjoy excellent views with a large picture window instead. 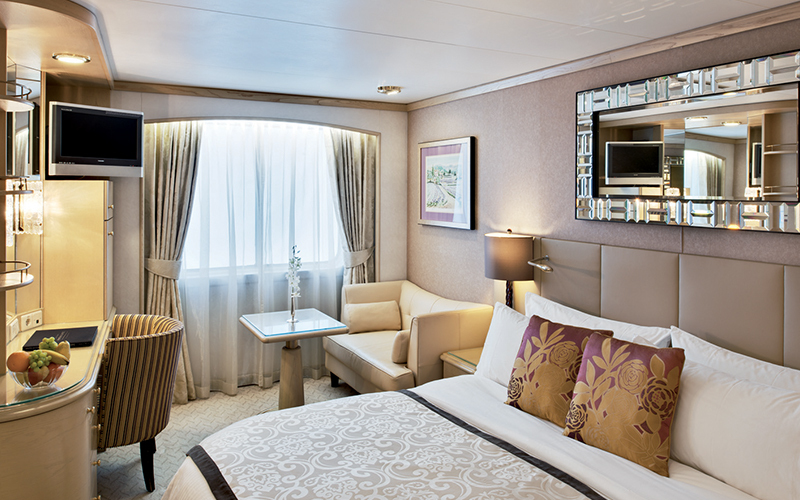 The stateroom is 18.77 sq m and includes a seating area and a bathroom with shower over bathtub. Your refrigerator will be stocked with complimentary soft drinks, beer and bottled water and selected complimentary beer, wine and spirits are available on request. You can enjoy 24 hour room service, luxury amenities, free unlimited Wi-Fi and more. Note that some Deluxe Staterooms on Decks 7 and 8 may have slightly or extremely limited view (categories E2 and E1) so we really recommend going for Category D, C2, or C1. Similar in layout to the Deluxe Stateroom with Large Picture Window, the only real difference here is that you get your own private verandah (bringing total size to 22.85 sq m). 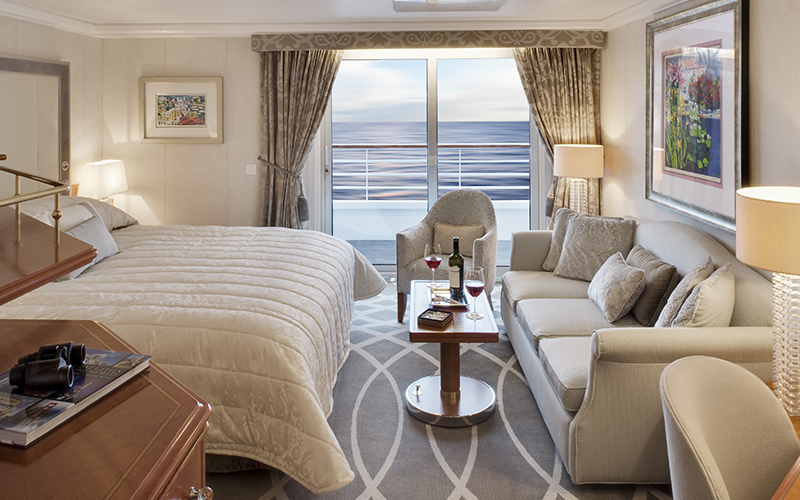 You’ve still got the same luxury amenities and services as the Deluxe Stateroom with Large Picture Window, but you can enjoy the fresh air and improved views from your verandah. Note that Category A2 have slightly limited views. Next up we have the Seabreeze Penthouse with Verandah, available from November 2018. 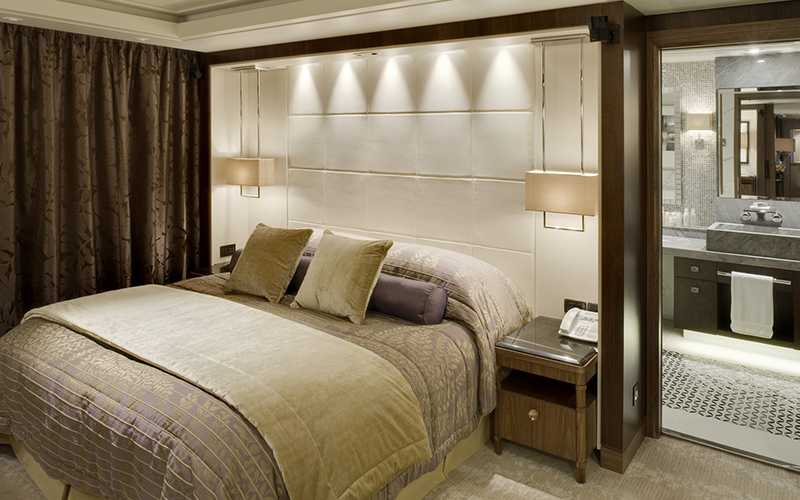 Quite a bit bigger than the staterooms (37.4 sq m), you’ll find a walk-in wardrobe and bathroom with large luxury showers with body jets. You can fit a 3rd person in this category and there is also a shared entryway with a second Seabreeze Penthouse that will allow you to connect the two. Additional services in this category include a butler on call 24 hours a day, unpacking and packing service if you wish, in-suite afternoon tea, pre-dinner cocktails and canapes and by-the-course in room dining service. You’ll also receive unlimited specialty restaurant dining, free in-suite phone (1 hour per cruise), dining at an Officer’s table (on request) and additional amenities such as personalised stationary if requested. There are two grades of Seabreeze Penthouse with Verandah – the SH and SP. SH is 37.4sq m, while the SP is 45.62 sq m. Aside from being more spacious, the main difference is that the SP has a separate living area. Now just when you thought the Seabreeze Penthouse sounded pretty good, step up a notch in the luxury and into the Penthouse with Verandah. It’s 34.09 sqm and beautifully furnished with luxurious fittings. In this grade, you’ll find a full Jacuzzi tub with separate shower and a spacious walk-in closet and all the services and amenities of the Seabreeze Penthouse. 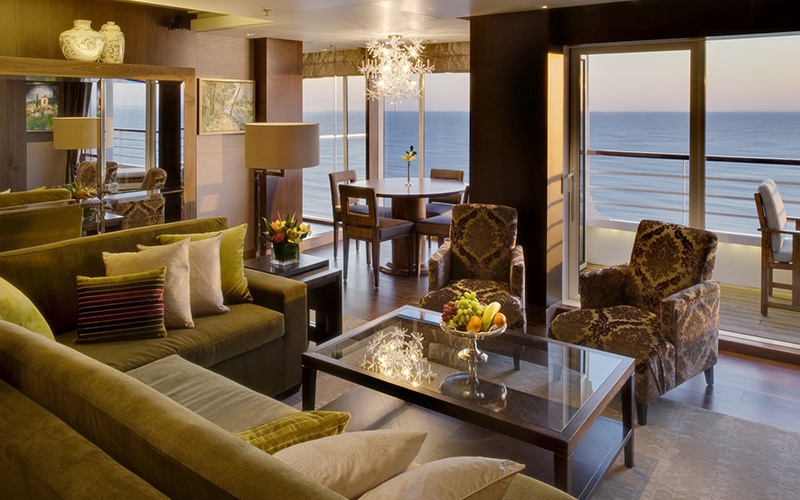 As with the Seabreeze Penthouse categories, there are two categories of Penthouse with Verandah – the PH and PS. The PH grade is 34.09 sq m while the PS is 49.98sq m. Again, the main diffence is the PS has a living area that can be separated from the bedroom. Finally we have the Crystal Penthouse with Verandah. With 91.23 sq m of luxury, this is the ultimate way to cruise! A private verandah with teak furniture, spacious living area with custom wool carpets, walnut floors, cabinetry and Swarovski chandelier, a dining area with spectacular floor to ceiling views, custom entertainment centre, custom built-in bar, separate study, master bath with Jacuzzi complete with ocean views, crystal sconces, marble floors and aquavision tv and even a guest bathroom … need we go on? As well as all the services and amenities included in the lower grades, you’ll also receive an invitation to a private Bridge Tour, cashmere blanket, private car & driver service to/from the airport, newspaper delivered daily, 2 hours free in-suite phone usage and more. 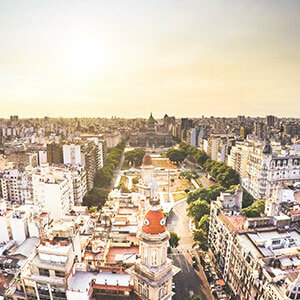 Ultimate Cruising and Crystal Cruises have two sensational cruise packages for you to choose from – a 17 night cruise from Papeete to Auckland incuding the Cook Islands or a 19 night cruise from Chile to Papeete via Easter Island and Pitcairn Island. 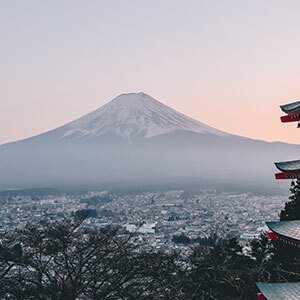 Click here to check these itineraries out or request a call from one of our consultants about these or any other cruises.